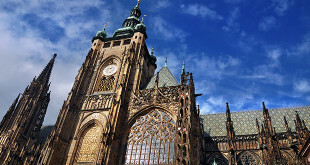 Prague’s religious structures emphatically document the city’s evolving styles of architecture and lots of them are packed full of religious art. However, they also mirror Prague’s periods of political and religious upheaval, its’ people’s lives, its’ obstacles and the expansion of the city. For orientation, keep in mind that churches usually have their main façades to the west and the choir to the east. 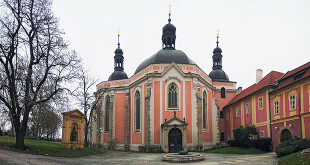 The Czech Republic is mostly a Catholic country and churches and cathedrals can be seen on almost every corner. 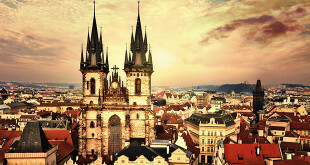 From St. Vitus Cathedral to the St. Nicholas Church, this is truly a ‘city of a thousand spires’. If you wish to attend English Mass, check our article about religious services. St. Nicholas Church located at Malostranske Square. The baroque interior is finely decorated with statues, paintings, and frescoes by leading artists of the day. The dome was completed in 1751, shortly before Kilian Ignaz died. Over the baroque organ is a fresco of St. Cecilia, patron saint of music. The organs were played by Mozart in 1787. The belfry was the last part to be built, constructed by Anselmo Lurago between 1751 and 1756. It is rightfully the most visited church in Prague. St. Vitus Cathedral located at the Prague Castle complex. St. Vitus is visible from far and wide. The St. Wenceslas Chapel is decorated with frescoes and semi-precious stones. 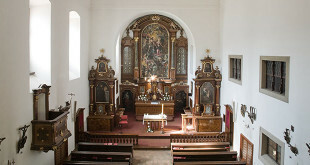 A door in the south-western corner of the chapel leads to the Crown Chamber in which the Bohemian Coronation Jewels are stored. 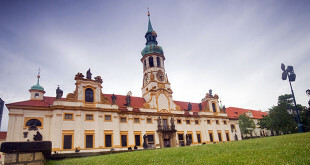 Strahov Monastery. 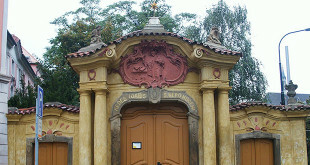 Rebuilt in Gothic style, with later baroque additions. As well as visiting the church you have to also visit the famous Strahov Library, comprising one of the oldest monastic collections in the country. Located in the theological and philosophical halls, it is over 800 years old and it still holds over 16,000 books. Church of Our Lady Before Tyn. The Church of Our Lady Before Tyn dominates one side of the Old Town Square. 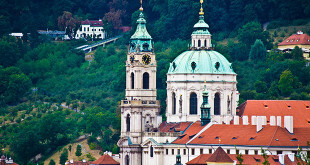 A great-looking Gothic church with a baroque interior, the building can be seen from all over Prague. Loreta. Important pilgrimage site, built to promote the legend of Santa Casa. A copy of the house, believed to be the Virgin Mary’s, can be seen, complete with original fresco pieces. St. George’s Basilica at Prague Castle. The best preserved Romanesque church in Prague, and the oldest church building in the Prague Castle complex. Church of St Gilles. Situated in the heart of the Old Town, it is a large church with beautifully crafted high ceilings and ornate decorations.